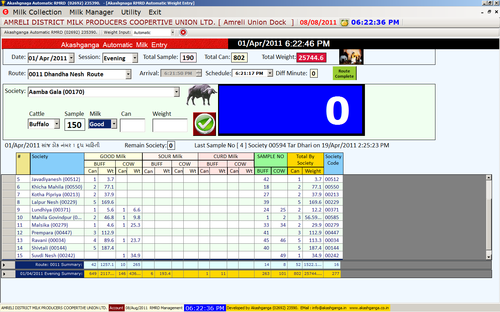 This software is developed looking into account the specific needs of Dairy Milk reception Docks and is generating reports as per the existing records maintained by the system. The software has been developed in the regional language looking into its perspective which includes milk reception, session receipts of total milk, employees attendance recording,society wise milk not received, Data transfer between two milk centers etc. Simple & Easy to operate. The system aids in automating Milk Reception by integrating all of its related activities through a centralized Computer. It also generates a variety of MIS reports which are very helpful for managerial decision making tasks and planning futuristic activities. » FTP Server based data transfer. » SMS to Milk Producers confirming their Amount of Milk Deposited on Daily/Periodic basis. » Smart Card based Data Transfer for integrating with Payment Gateway . » Financial Accounting Software upto Balance Sheet (with Regional Language support). » Nano ( Hand Held Device) based Milk Collection System. » Solar Operated Milk Collection Systems. » Sessionwise Weight Summary Report. » Daily Detention Report with Weight..
Data transfer from BMC to Milk Union, SMS Confirmation etc. AKASHGANGArevolutionised the Indian Dairy Industry by replacing the traditional methods by fully automatingmilk collection process. Shree Kamdhenu Electronics Pvt. Ltd. (SKEPL) conceptualized the need of an Automatic Milk Collection System (AMCS) in early 1990 for Ensuring Transparency , Mutual Faith and Error free operations of the Milk Collection by integrating Electronics Weigh Scale with Quality testing equipment ( EMT or Milk Analyzer) & Data Processor/ Computer, we are pioneered in the participating of rural people with modern technology.